EVA Optic is a Dutch developer and manufacturer of LED lighting for specialist applications. EVA offers solutions when the requirements for light experience and quality are particularly high. Golden Coast is the exclusive distributor of EVA Optic Specialist products to the UK wet leisure industry. There are few more demanding environments for a lighting system than the heat, moisture and chlorine of a swimming pool. Regular LED lighting may not always be sufficiently resistant for a swimming pool installation. EVA Optic developed a range of LED lighting specifically for the aggressive swimming pool environment; EVA Optic underwater lighting the Aqua HE product line for ambient lighting. 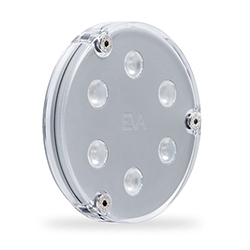 EVA Optic underwater lights are known for their quality and durability. Due to the high efficiency of EVA LED lighting, they show a very rapid return on investment, often between just 3-5 years. The lighting can be controlled via a tablet or smartphone. There are standard colour changing programs, and customisable programs and it is even possible to link the lighting control to an audio signal for an immersive audio-visual experience. 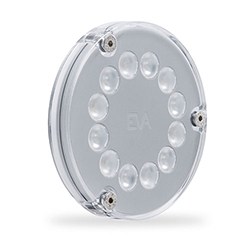 The EVA Aqua HE product line is durably resilient to chlorine, heat and moisture and this ambient lighting range includes linear lighting and down-lights, spotlights and wall lights. Heat, particularly near the roof of a pool facility, can be extremely damaging to ambient lighting. EVA’s self-regulating heat control (ATS) helps to prevent premature failure and as a result units last much longer. 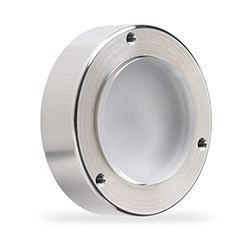 Compared with halogen equivalents, either system offers an energy saving of over 85%. The low-maintenance, high-quality systems comply with the relevant European standards for lighting levels (EN-12193) and emergency lighting (EN-1838) and are suitable to fully equip every type of swimming pool. EVA Optic LED lighting is appropriate for a top-end domestic installation or to be specified for a commercial application.